Retrouvaille, the lifeline for married couples, is twenty years in Ireland this year. Members are gathering today in Dublin (Sunday 8 May 2016) in celebration and hope. Outgoing co-ordinators, Pat and Marian Duff, hope that many more couples will find out about Retrouvaille as there is such a need today for support and healing in married life. An estimated 800 couples have attended Retrouvaille programmes since 1996. From statistics compiled in the US, the organisation estimates that around 80 percent of couples who attend their weekends manage to rebuild their marriages and rekindle their love. In Ireland, the weekends are held twice a year, lead by couples who have themselves been helped by Retrouvaille. “We have been through the incredible pain of marriage breakdown ourselves, so we know exactly what couples are going through,” says Pat Duff. The couple say there is no judgement of anyone at Retrouvaille weekends. Instead through several workshops, couples are given the tools to understand and communicate with each other. 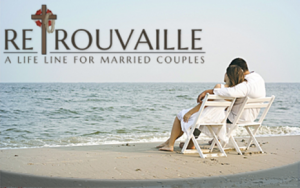 “Retrouvaille gives couples hope and direction to grow a new relationship. They learn that what people often believe to be the problems in marriages – affairs, addictions, unemployment – are often just symptoms,” says Pat Duff. His wife Marian notes that using the ‘tools of Retrouvaille’ they were able to revitalise their marriage and change the atmosphere at home to the benefit of their family. “Using the tools that we learned from the programme we were able to identify and express feelings to each other for the first time. We cleared up wrong assumptions and misconceptions that we had about each other. This brought us to a deeper understanding and a deeper relationship,” she recounts. Weekends focus in particular on opening up communication on a heart to heart level between couples, sometimes for the very first time. The programme also explores conflict management as well as the impact a person’s family of origin (the family he or she has grown up in) has on his or her attitude within their marriage. Members of Retrouvaille and their families are incredibly grateful for the gift of a renewed marriage. “It saved our marriage. I would stand outside handing out flyers for Retrouvaille, because what they did for us was unbelievable,” say Sarah and James who attended a Retrouvaille programme in 2014. The 20th anniversary celebration today will feature inputs on the history of Retrouvaille in Ireland, presented through the volunteers who have been leading its courses over the past 20 years and focus on the challenges faced today for young couples. “It has always been a challenge to have love grow continuously in a marriage, but nowadays it is perhaps even harder because of the increased pace of life and diminishing support for marriages,” say Sallyann and Torbjorn. Retrouvaille (a french word meaning ‘rediscovery or finding again’, is an ecumenical organisation which grew out of Marriage Encounter in Canada in 1977.